Tropical Storm Alex has pulled away from the Yucatan Peninsula and the shallow Gulf of Mexico quickly today. He hasn’t strengthened to hurricane status quite yet, but is close to doing so. At this point, it is unlikely that he will strengthen to major hurricane status prior to landfall. T.S. Alex’s current position is 22.9N, 93.6W; is moving NW @ 13mph; has sustained winds of 70mph; has a central pressure of 981mb, which is low for a Tropical Storm. T.S. Alex should continue to turn more westerly through the next couple of days. His official track forecast brings him ashore along the Mexican coast, though the specific landfall keeps moving north with successive model forecasts. T.S. Alex should keep strengthening over the next day, prior to landfall, making hurricane strength later today but not quite getting to Category 2 status. Thus, he should make landfall as a Category 1 hurricane somewhere in northeastern Mexico. Storm surge is already impacting the Gulf coast of the U.S. with <3′ surge along the LA coast and increasing to 3-6′ surges further south along the TX coast. Categories: science | Tags: 2010 Atlantic hurricane season, Tropical Depression One, Tropical Storm Alex | Permalink. The June 2010 issue of Scientific American had two climate-related pieces in it that I thought were worth discussing. The first dealt with 12 potential events, their likelihood of occurring by 2050 and some of their effects. The front cover lists ‘Polar Meltdown’ last among the 12. The article has ‘Polar Meltdown” as the 8th event, despite its likelihood; I don’t really understand how they decided to organize the events. I mention these details first because more of the general public reads Scientific American than journals or even climate-related blogs. Given the nature of the effects – vastly more negative than positive – I would personally prefer to see this listed first both on the front cover and in the article. Interestingly, their online version has this event first, which is good news. Another quibble: the picture accompanying the little piece is of Antarctica instead of the Arctic. In terms of “Polar Meltdown”, Antarctica definitely presents the larger long-term threat of the two. But the article is supposedly about events by 2050. I’m a climate realist – which means I recognize that Antarctica won’t completely melt by 2050. That will likely take a century or two. And it’s not really even the Arctic ice melting that should scare us all – it’s Greenland. Greenland’s ice has been land-bound for thousands of years. When that ice melts, it will raise sea levels. Similarly for Antarctica – it’s not the sea ice melting every year that presents a threat, its 8 times as much ice as exists on Greenland melting that will raise sea levels even higher. There are plenty of graphics demonstrating the ridiculously fast meltdown that has already occurred in the Arctic. They should have shown some of those instead of an Antarctica-shaped piece of ice in a punchbowl. That’s a lousy visual on multiple levels – the most important being water-borne ice melting doesn’t change the level of the water. Sheesh. Okay – onto the science part of this potential event. Scientific America’s author thinks this event ranks as “Likely”, or better than “50-50” but not “certain”. I’m glad to see the assessment at better than 50-50, because it is. Given the speed at which Arctic and Greenland ice has already melted, I unfortunately think that Arctic sea ice in particular is within a handful of years of disappearing every summer, as this post details. Arctic sea ice volume is plummeting towards an effective zero point much, much faster than any expert thought possible just a couple short years ago. If you go to their online version and click on the ‘polar meltdown’ icon, it takes you to a page describing some effects of the event occurring – none of which appear in the print version, by the way. There is also a place to vote on how likely you think this event is of occurring. As of this writing, the highest percentage of respondents (36%) agree with the author. 29% of respondents think it is almost certain. 14%, 11% and 8% think it is ’50-50′, ‘unlikely’ and ‘very unlikely’. There’s freepers everywhere, I suppose. Categories: environment, global warming, science, technology | Tags: climate change, climate change effects, global warming, polar meltdown, polar warming, Scientific American | Permalink. Tropical Storm Alex moved fairly quickly over the Yucatan Peninsula this weekend, entering the Gulf of Mexico last night. He also maintained his integrity very well while over land. Banding features and central low development actually continued while transiting the peninsula. Thus, T.D. Alex reintensified into T.S. Alex just prior to moving back over water. T.S. Alex’s current position is 20.3N, 91.7W; his maximum sustained winds are 60mph; is moving NNW @ 6mph; and his central pressure is now 989mb. The lowering central pressure and resulting increasing wind speeds indicate that Alex will continue to intensify as he moves over the warm Gulf waters and enjoys upper-level venting support. Whereas forecasts last week had Alex remaining as a Tropical Storm until his eventual landfall, it now looks like Alex will strengthen into the 2010 season’s first hurricane. If conditions remain favorable, Alex could even intensify into the season’s first major hurricane also (>= Category 3 strength). T.S. Alex’s official track forecast over the next 3 days takes him on a gently arcing path through the southern Gulf of Mexico, potentially making landfall near the Mexico/Texas coast this Thursday. After 3 days, the storm is projected to move near the Mexican/Texas border through Saturday. There remains considerable division in model track solutions with some showing something akin to the official track forecast while others show a marked turn to the north as the storm approaches land. At this time, the only effect that has is to shift the point of landfall further north along the Texas coast. T.S. Alex’s official intensity forecast calls for a Category 1 storm to form by tomorrow morning and a Category 2 storm by Wednesday morning. He is projected to make landfall as a hurricane Thursday morning. Interestingly, it looks as though most intensity models show Alex strengthening to just below hurricane strength. The official forecast relies more on models that have performed the best in past years. Alex’s growing windfield will begin impacting the Gulf oil disaster in the next couple of days. Winds will turn easterly and increase in strength, even though Alex is hundreds of miles away from the disaster site itself. This will have the effect of pushing oily water back into the coasts of LA/MS/AL. As of 5A EDT this morning, the National Hurricane Center upgraded Tropical Depression One to Tropical Storm Alex. A hurricane hunter aircraft found flight-level winds of 46kts and satellite-derived near-surface winds were estimated to be 35kts. With those two indicators, and given the storm’s organization, the 2010 season’s first tropical storm has officially formed. Alex’s center is currently located at 17.0N, 85.3W. His maximum sustained winds are 40mph; moving WNW @ 8mph. His central pressure is ~1004mb. Not much has changed for T.S. Alex’s projected track or intensity for the next few days. He is expected to continue moving WNW to NW over the next three days. Given his current position – north of Honduras in the western Caribbean – this will take Alex over either Belize or the Yucatan Peninsula of Mexico. While over land, Alex will weaken back into a Tropical Depression. The official track forecast has Alex entering the Gulf of Mexico sometime Monday morning, then continuing more or less in the same direction through Wednesday. Beyond that, the track guidance is still a little split, but a lot more of them keep Alex in the western Gulf than in the eastern Gulf than was the case yesterday. Once Alex re-emerges over water, he should reintensify from a Tropical Depression back into a Tropical Storm. Landfall could occur along the Mexican coast later in the week as a Tropical Storm. In the meantime, Alex is dumping plenty of rain in Central America. With inches of rain falling per hour in the heaviest rainbands, flash flooding will be the primary threat to residents there. Atlantic Tropical Weather – 6/25/2010: First Tropical Depression? Tropical Depression One has formed off the coast of Honduras in the western Caribbean Sea. The Air Force Hurricane Hunter aircraft found a well-defined central circulation. The system continues to get better organized by the hour with large rainbands extending hundreds of miles away from the center. TD1 is still expected to move northwest across the Yucatan Peninsula and enter the Gulf of Mexico late Sunday the 27th. Thereafter, the official National Hurricane Center track forecast splits the difference of the two model solutions discussed below and keeps the storm on a general north-westerly track through the Gulf. A disturbance that has made its way across the entire Atlantic Ocean and Caribbean Sea has finally developed a surface circulation and has sustained thunderstorms around it. Currently identified as Invest 93L, it could be designated Tropical Depression 1 of the 2010 Atlantic Hurricane Season. Invest 93L’s center is currently located near 16.9N, 82.9W. It is moving NW @ 5mph and has maximum winds of 35mph. An Air Force Reserve Hurricane Recon plane was sent to the system earlier today to see if it is organized enough to be classified as a Tropical Depression. Numerical model solutions differ on its future. 3 of them take the system over the Yucatan Peninsula and into the southern Gulf of Mexico over the weekend, then show the storm turning more westerly toward Mexico or southern Texas. 3 others also take the system over the Yucatan and into to Gulf, but then the storm moves north under influence from an upper-level trough projected to move across the eastern U.S. after this weekend. The result is two storm tracks that are nearly exactly opposite each other. Obviously, we will have to wait until the storm has moved over the Yucatan to have a better idea of its long-term path. Once it clears the Peninsula, it should be a weak Tropical Depression again; models are projecting a re-intensification over the very warm Gulf waters. Categories: science | Tags: 2010 Atlantic hurricane season, Invest 93L, Tropical Depression One | Permalink. The first five months of 2010 have been the warmest in recorded history. But have you seen that story covered by the corporate media? Nope – and you aren’t likely to any time soon either … at least until the records become so widespread and intense that there’s no longer much we can do about them. Both the NASA and NOAA analyses of global temperatures have marked the warmest month of May, the warmest 3-month March to May period and the warmest 5-month January to May period in recorded human history. Both datasets go back 131 years into the past. The warmest month, 3-month and 5-month periods out of 131 other years has been reached. Perhaps if the highest scoring Super Bowl in history had just occurred, some corporate entity might be interested in covering it. NASA’s global analysis reported a +0.66°C (+1.134°F) surface temperature anomaly for May 2010 (over the 1951-1980 base period). This tied the previous record anomaly from 1998 and beat the 0.59°C (1.062°F) anomaly from 2005, according to NASA’s GISS dataset. NOAA’s global analysis reported a +0.69°C (+1.24°F) surface temperature anomaly for May 2010. According to the NOAA methodology, the next warmest May was observed in 1998: +0.63°C (+1.13°F). With record and near-record monthly temperature averages observed so far in 2010, it is no surprise to see the January-May period this year also setting a temperature record. According to NASA, the Jan-May 2010 period has been the warmest at +0.72°C (+1.3°F). For comparison, NASA includes the same period from the two warmest years in their dataset so far: 2005 and 1998. Globally averaged surface temperatures in Jan-May 2005 were +0.62°C (+1.118°F) and during the same period in 1998 were +0.61°C (+1.098°F). So the Jan-May 2010 observed warmth was 0.10°C more than the same period in the warmest year to date on record. According to NOAA, the Jan-May 2010 period has also been the warmest: +0.68°C (+1.224°F). The NOAA site also contains information from the same period during the warmest or the next warmest year on record. Their methodology differs slightly from NASA’s, but is just as valid and acts as an independent check on the other dataset. NOAA’s methodology identified 1998 as the next warmest for global land and ocean surface temperatures at +0.67°C (+1.21°F). Global averages and multi-year trends are all very well and nice, but what do these records mean? Is there a way to contextualize them in more day-to-day terms so that more of the public can understand the threat they pose? I think so. I’m going to provide a couple of examples that mean something to me; hopefully they help clarify the problem for others as well. Record high temperatures have been occurring in the Middle East and Africa. I know, big shock, you haven’t heard of those in the corporate media either. Well, they happened. I’m sure one of the stereotypical concepts of the Middle East and portions of Africa is the incredible heat the region experiences. So what kind of records are we talking about? Try 125.6°F (50°C) in Basra, Iraq on June 14; 125.6°F (50°C) in Jeddah, Saudi Arabia on June 22; 117.7°F (47.6°C) in Faya, Chad on June 22; 116.8°F (47.1°C) in Bilma, Niger. Bahrain had its hottest day ever in June on the 20th – 46.9°C; Qatar similarly hit its hottest June day ever with 48.8°C. Kuwait saw 123.8°F (51°C) on June 15th, missing their hottest all-time temperature by 1°F (0.9°C). Myinmu, Myanmar hit its all-time record high back on May 12th – 116.6°F (47°C). Okay, those are some really high temperatures. Along the Front Range in Colorado, 100°F and higher have until now represented extremely hot days. 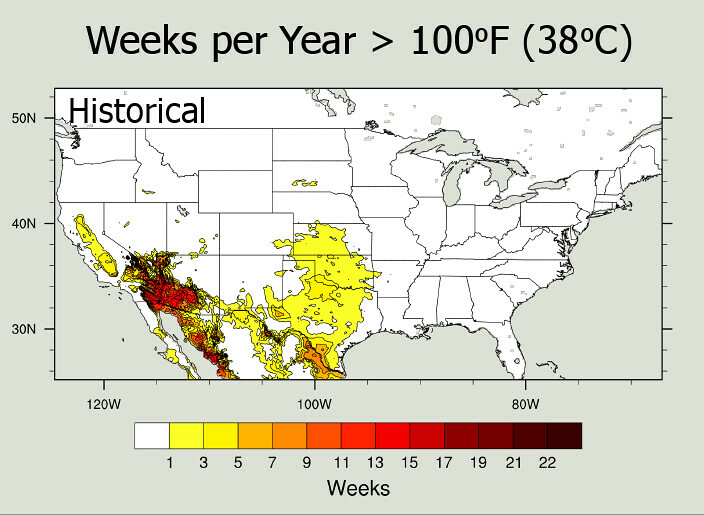 The frequency of 100°F days was, in the 20th century, pretty low – a couple of days at most during any one year, as the figure below from a recent NOAA report shows. We have a choice to emit fewer emissions through the end of this century or more emissions. 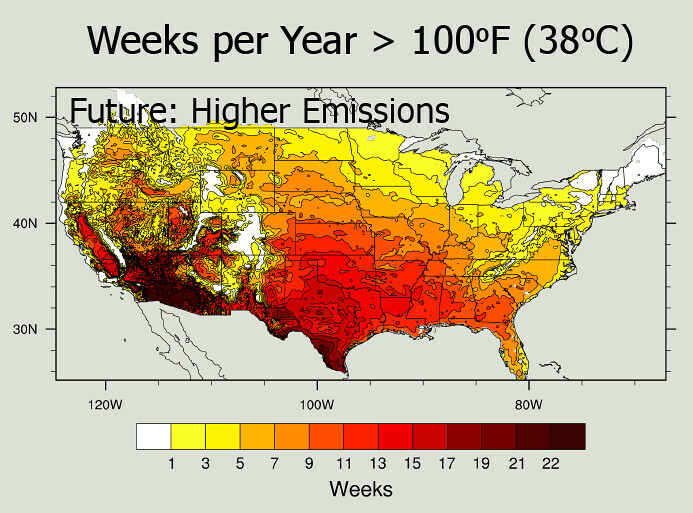 How many 100°F days could Colorado see if we take the low emissions path? 7-21 per year (1-3 weeks) for the Front Range and 35-49 per year (5-7 weeks) for southeast Colorado, as the next figure shows. It is important to keep in mind that this emissions scenario depends on us changing our rate of pollution quickly and aggressively, something that does not look likely to happen. Given our current, actual greenhouse gas emissions, which track along or slightly above the IPCC’s A1F1 scecario (the highest they considered), what kind of summers can we expect to see later this century? 8 weeks of 100°F days every year could become “normal”. Not once or twice a year – up to 2 months of 100°F days. Areas in southeast Colorado could be subjected to 12 weeks of 100°F days – the entire summer! – as the figure below shows. In fact, nearly the entire country would, for the first time, experience 100°F days. The desert southwest? Given their current maximum yearly temperatures, I have to think they would find out what the Middle East goes through. 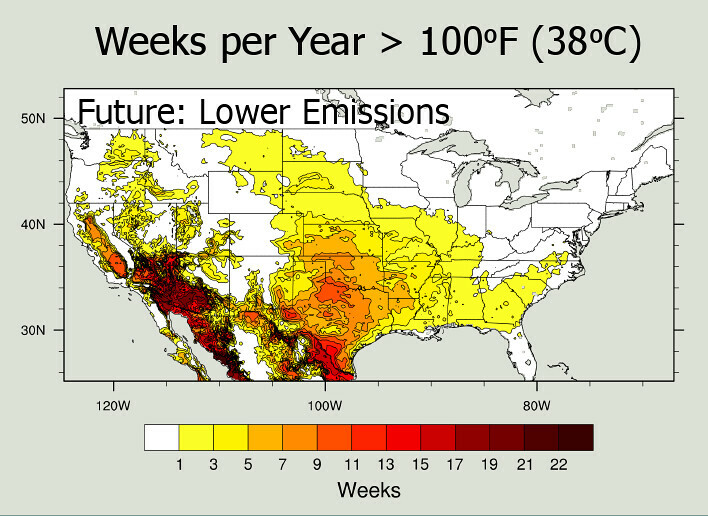 Can you imagine what weeks of 100°F days would do to our agriculture, power sources and water supplies? If we can imagine that hellish future, do we want to avoid it? I hope that images like these and the implications of those realities coming to be will spur even more people to change their own personal lives as well as demand changes on the local, state, national and international scales. Those temperature records I started out with could seem relatively balmy compared to the high emissions future we’re headed toward. Categories: environment, global warming, NASA, science | Tags: climate change, El Niño, global temperatures, global warming, NASA, NOAA, solar minimum | Permalink. I fully support progressive primary candidates for elected office. The higher the office should be the better, but there seems to be a large jump between being able to get a progressive elected as a Representative and a Senator. Senate races attract a lot of money and influence from entities that typically don’t spend much if any time in the states whose races they help decide. There are a number of cases in the past four-plus years regarding progressive challenges for Senate offices that have failed across the nation. Two now stand out in my mind. The first was the summer of 2006 in Connecticut. Sen. Lieberman (then a Democrat) had clearly (to progressives) turned his back on the Democratic Party by joining with the Bush Regime on any number of important issues and bills. Ned Lamont ran an extremely successful campaign against Sen. Lieberman – and actually won the primary. Lieberman turned into quite the spiteful hate-child and created his own political party out of thin air and ran against Lamont in the general as an “independent”. Unfortunately for Connecticut residents, and the country it turned out, Sen. Lieberman garnered more Republican votes than the Republican candidate and won the Senate seat by holding onto enough Democrats to edge out Ned Lamont. The Senate and the country has been forced to deal with Sen. Lieberman for another four years since. More recently, Arkansas Senator Blanche Lincoln has worked overtime to work against and undermine President Obama’s centrist policies. At least until a viable primary opponent appeared, that is. Sen. Lincoln proposed a few decidedly progressive amendments to major legislation this year as Bill Halter’s numbers surged and he placed a close second last month. This month’s run-off contest ended up being pretty close – but Sen. Lincoln prevailed. The worst news is yet to come. Instead of a solidly progressive Senator from Arkansas, the Republican candidate will handily beat Sen. Lincoln in their general election. Why? Because Sen. Lincoln had pissed everybody off. She fought against centrist and progressive causes for the past six years – progressives aren’t likely to work to get her elected. She’s not a Republican, as much as she’s tried to look and act like one for the past six years – conservatives and the extremist tea-baggers aren’t going to vote for her. So Republicans are likely to pick up a southern seat as they maintain their do-nothing attitude is best for America stance. Underlying both of these races is a common theme that I haven’t seen a lot of discussion about, even in the progressive blogosphere: Ned Lamont and Bill Halter ran strong campaigns and both nearly became Senators. The main problem was voters didn’t have enough time to get to know them. It’s expensive and time-consuming to run a Senate race. Instead of meeting people, Senate candidates spend hours every day begging for money from the large donors. I think at the end of the day, it’s important to keep identifying and supporting progressives for lower offices first. Lamont’s and Halter’s races were exciting to watch and it was gratifying in some sense to watch the political establishment grow nervous that people might actually decide elections instead of special interests. But voters want to know who they’re voting for – or against. Sometimes, records can be an anchor instead of an engine. But progressives have ideas and solutions, in direct contrast to the tea-baggers inane and ambiguous anger at everything … not them or theirs. The more progressives are elected at local and state levels, the more voters will see proof that those solutions are viable and necessary. After all, on every major issue we face, a majority of Americans hold progressive views. It goes unreported and undiscussed, but its true nonetheless. Success breeds success. I await the day when progressives move up the political ladder and help 21st century policies get passed. Lamont and Halter won’t do it in 2011, but someone some day soon will. Categories: framing, meta, politics | Tags: Bill Halter, Ned Lamont, primaries, progressivism, Sen. Lieberman, Sen. Lincoln | Permalink.